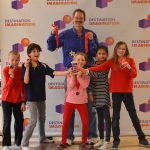 Destination Imagination congratulates all the students who participated in the 2018 Virginia Affiliate Tournament. We think you are all winners! Page generated by the Destination Imagination scoring program version 2018 (Release)-20180204 on Sat Mar 24 16:46:59 EDT 2018.